Everyone earned Q’s, wins and even Semi-Finals byes and made some friends. It was a super event, the surface, the property, the AKC crew, my traveling partners Tammy & Rhonda. Franky came along for the ride and took everything in stride. My best buddy Ray was awesome as usual perfect in every way. He was spot on with all cues and start lines. It is so sweet to trust and enjoy the event and courses with him. 4 Rounds for us, ISC @24″ Ray did very well, we ran clean in our first run of the event and placed nicely in 8th, earned a little $$ for it. 20″ R1 Standard, faulted at the RAF, sharp left turn that gave us a 5 pt fault. Stumbling myself after the AF I caught myself thankfully and Ray pulled up a bit since he became further ahead as I lost momentum. Finished the course nicely. Since we are not the fastest team out there I knew that was pretty much it for us to make Finals. So the goal became run like we would make finals and we did. Two more clean rounds in R2 Jumpers and Hybrid as well. Neither of us let one another down, we rallied and did our best and finished like Pro’s. It was terrific to sit in the stands during Challengers and Finals under a new announcer that gave life to the event, a welcome change. Congratulations to PNW competitors that made it to the end and placements are cream on top! The surface was one of the best for an AKC Nationals event. Mike turned it over an over and even before finals, what a treat that would be to run on a fresh surface. Thank you AKC for a better than ever event and I look forward to Reno next year running both boys! Thanks Tammy & Rhonda for being terrific travel companions. ESSC 3-5-2017 The boys did awesome today! I have been working more on motivation off the start line and when working small sequences, I’d say it paid off today, so yes I will keep it. Franky passed Ray in JWW time today by a ton. He is still sorting out his foot work in the weaves. Two footin it and single striding here and there. So its coming along more and more often to single striding. Ray was pretty hot today as well, loving the restrained send to the tunnel today. 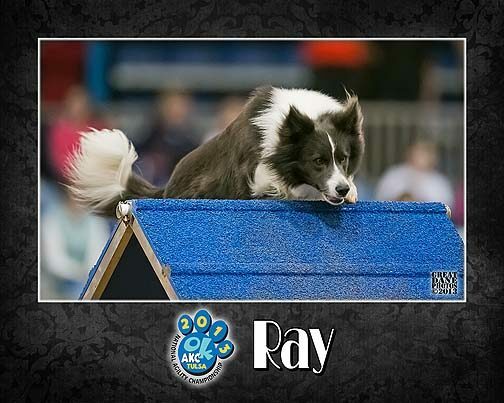 Sooo looking forward to AKC NAC later this month with Ray. Franky is going along for the ride this time.